3.8 out of 5 based on 57 bloggers and 10 commenters. 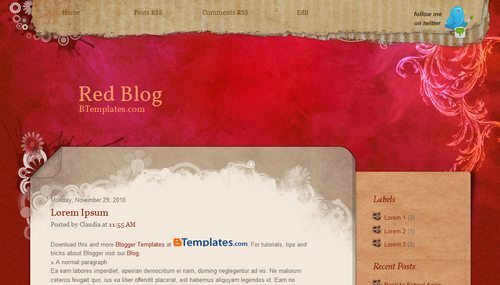 Red Blog is a free blogger template with 2 columns, right sidebar, rounded corners, grunge style, girly looking and vintage style. I love your theme that you have done, but wonder if you can change the font in any simple way? have different fonts that I want in my blog but fails to change. Something you can help me with? I really like this template, but I’m having problems with the comments posting. Do you have an updated version or solution? @Vik: The comment posting works fine in the demo. Please, explain me which is your problem or leave your blog URL if you want additional help. I’m enjoying this template a lot, but I just noticed it won’t let me italicize or put words in bold. Any idea for fixes? Thanks so much. I really like this template but I’m having some problems with it. In blogger, under “Design and side elements” you are suppose to be able to rearrange elements in your “post editing box”, for example reactions, sharing, send post and so on. They doesn’t show in my blog how much I choose them. I rearrange them but everything stays at the original spot. I can’t do anything with these choices. It also leaves a empty space in between every post. I really like this blog template but how can I add those links like “home” and “comment rss” to my blog. There is this section at the top but somehow it stays empty in my blog. In the demo version this panel at the top worked nicely. I would really appreciate if somebody could tell me what should I add to the template HTML for it to work as nicely as the demo. I love this template n i have use it on my blog but my on my blog no home on the top so, to use it.. Thank You Very Much..
What is the license for this template?